Price: $37/month, $77/year (60% discount), $497 for life. and grab your bonuses and 5-day free trail! 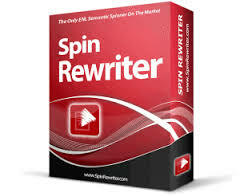 On October 14, 2015, The new version of (Spinner Rewriter 6.0) was released as an entirely new generation of article spinners. This makes Spin Rewriter capable of spinning your article based on the original meaning of your article. Now suppose that you have created a few websites of your own and signed up to some affiliate sites to promote. Now you have to get traffic to your site, but how? So you tried submitting to a few article directories, what a let down that was. The new updated Spin Rewriter has a load of features and claims that it can generate tons of unique content for you by spinning articles. Very fast, spins your content in seconds, no waiting. It can spin phrases, sentences and paragraphs, this feature can create several different unique versions of your articles. automatically puts it in spintax format. Can export your articles for posting on your website for link building. And another special feature is that the tool is able to intelligently improve itself over time. It learns from your usage to, grow its database of synonyms and phrases. Entrepreneur, Developer, Marketer, Aaron Sustar, basically developed the spin rewriter to spin and generate better superior content for his websites and link-building, after Google Penguin and Panda updates wiped out a lot of blogs and websites that changed his rankings and he wanted to do something about it. With his tools & methods, he started ranking all over the internet again, this software created an entirely new opportunity for him. With Spin Rewriter being marketed as a fast traffic getting tool it will not generate traffic for you. Spinning articles do not bring visitors to your site. You have to build back links for the articles you create. Building your back links in SEO today has to be done with care. The quality of your article depends on the type of articles you spin. If you try to spin a highly technical article with difficult words to spell and understand, the tool has trouble spinning good versions of this kind of material. The spin writer is more capable of working best with stander and simple articles. The simpler the better it works, and most web users like easy to read text. It is s not a complete money making or fast traffic getting tool. Its does not find you keywords, it does not find your niches and make conversions for you. Spin Rewriter sounds like a very good Spinner to use if you are into spinning articles. Price: $37/month, $77/year (60% discount), $497 for lifetime. A free Keyword Research Tool. This tool helps you find profitable keywords. You will learn how to chose a profitable niche, Understand how to make money online, and make conversions. And you will also have 2 websites hosted free.